Our water-activation devices are not magic or products for gullible users. The name “3Quellen” refers to what we consider to be the three most important water activation techniques. We have turned various pieces of research work and findings, with defined materials and components, into a device. 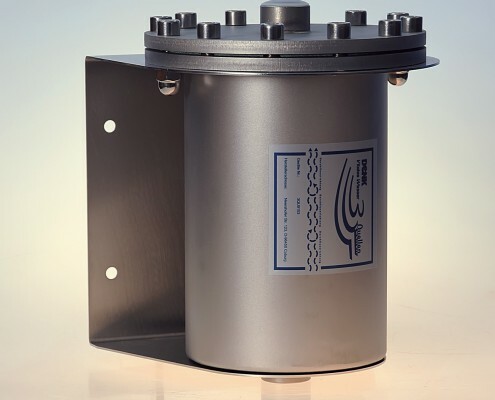 3Quellen devices are made from reactive neutral V4 stainless steel of drinking water quality with a wall thickness and density that are able to withstand possible pressure of up to 6 bars. There is a flange with internal thread at each entrance and exit. This makes it safe and easy to incorporate into the pipe system. The source stones are located inside, where they are arranged one behind the other to form the “activation course” for the resting and flowing water, described above. For connections in apartments, houses and medium-sized businesses. Length 30.5cm, Ø 22cm, 12kg. Assembled ready for connection, including wall-mounting and attachments. Connection: 2 x flange with 1 inch internal thread. Price: 1.580,- EUR incl. 19% Mwst. 1. The forward and backward rotation of the Pulsator creates a double swirl and specifically transfers kinetic energy to the water. 2. 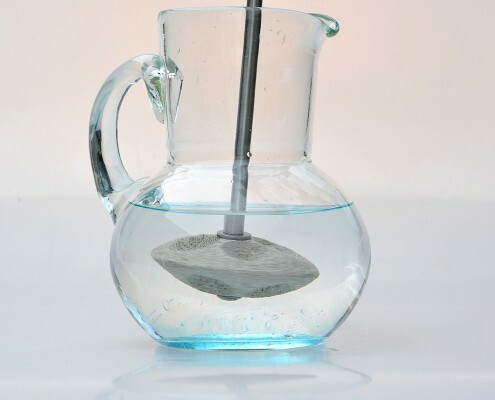 The minerals that are bound up in the CeraAktiv ® ceramic transfer their positive information to the water. 3. The EM surface of the CeraAktiv has a supportive effect. The Pulsator has been designed for up to 2 litres of water. Pour mains water into a glass or ceramic container. Leave the Pulsator in the water for at least ten minutes. Rotate the Pulsator back and forth for around 20 seconds before drinking. 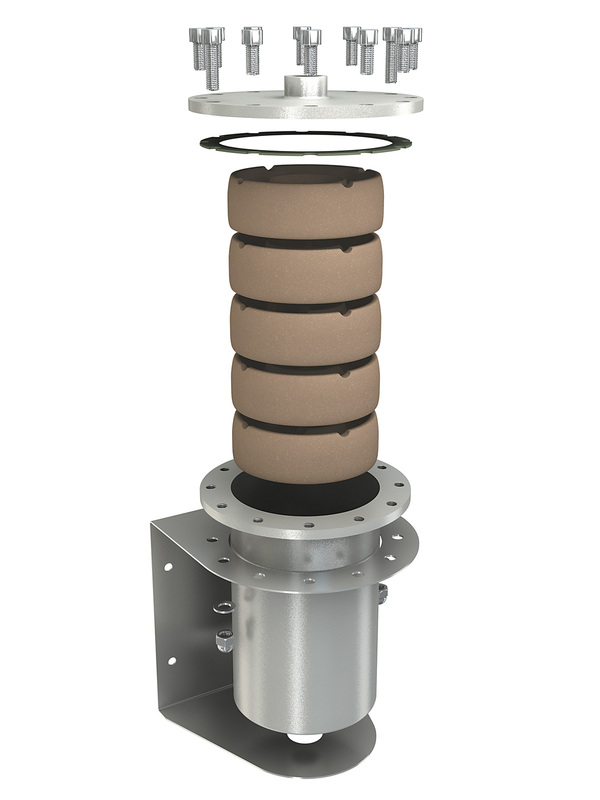 You can extend the rotation time depending on the quality and quantity of the mains water. You can also leave the Pulsator in the water for longer. Rinse the Pulsator under running water and leave it out to dry. Do not use any cleaning products. The classic crystalline structure of the bound minerals can be seen on the edges of the Pulsator, which have been deliberately left untreated. As a result, the Pulsator might scratch the water container when it rotates, so please use it carefully. The Pulsator consists of a specially shaped activation disc made from CeraAktiv ® ceramic. The stem is made from reactive, neutral V4 stainless steel of drinking water quality. We have applied for a patent for the Pulsator. The Pulsator will not age or wear. L 26cm, Ø 8cm, 260g. Price (without pitcher) 69,- EUR incl. 19% Mwst. Our EMCRYSTAL® drinking water pitcher is made from crystal glass with an EM surface that has been specially designed for this purpose. The effect is durable and does not wear off. EMCRYSTAL® is handmade in Germany using a manufacturing process that isn’t used anywhere else in the world. 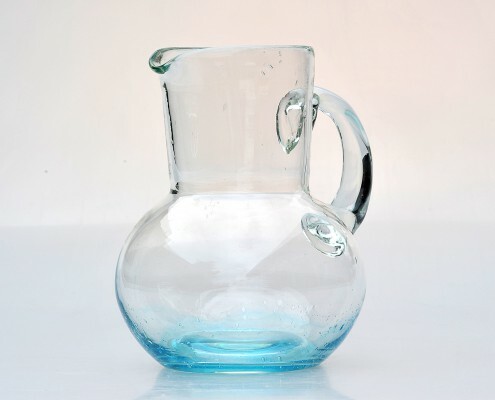 Just pour mains water into the pitcher to create a pleasant, fresh taste. Together with glassmaker Cornelius Rèer we have developed the world’s first EM glass – EMCRYSTAL®. A complex process is required to give glass an EM surface. In this process, the EM structures are applied to the outside of the glass while it is still hot, something we have achieved for the first time with EMCRYSTAL®. EMCRYSTAL® can only be hand-blown in special beech moulds. Industrial production is not possible. EMCRYSTAL® glass is not industrially smooth, but has a surface structure that is visible to the naked eye. The thick-walled glass is also honeycombed with tiny chambers. The base is reinforced and shaped in an inward curve. The glass shimmers with a slight turquoise colour. Our EMCRYSTAL® is a high quality piece of glasswork and a looks great on any table. Price: 79,- EUR incl. MwSt.